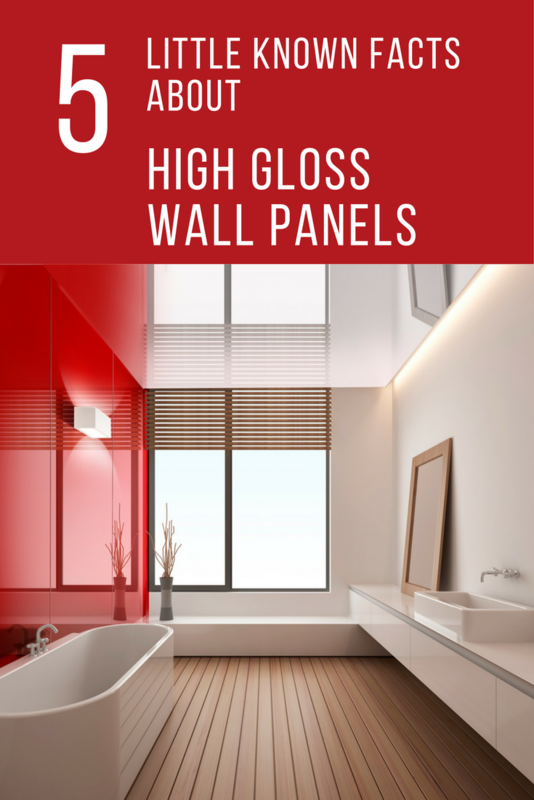 In this article, I’d like to dig “under the hood” to give you some little-known facts (at least in the United States) about these fun and functional high gloss wall panels. At the end of the article let me know if you have any questions which weren’t covered in these 5 facts. When people think of acrylic and hot spaces most assume they can’t be used in steam showers and behind stoves in the kitchen, however this is not the case with optical grade (hard coat) acrylic wall panels. If the temperature is lower than 130 degrees you can use these decorative colored wall panels in a steam room or behind an electric stove top. Standard acrylic wall panels (not high gloss) are not be recommended in these places. This high gloss kitchen is sleek. It is using a carbon black kitchen backsplash and mocha colored gloss cabinet fronts. If you’re like a lot of parents and tell your kids to stay away from the skilled trades (carpentry, plumbing, electrical, masonry etc.) and go into fields like computer technology you are contributing to the problem of finding a decent contractor in your town to install a product they have not worked with before. So, when you ask a recommended contractor to install a product (like high gloss wall panels) don’t be surprised if they tell you they are too busy – or they only work with tile showers or ceramic kitchen backsplashes. When there is a lot of demand for their services your contractor not be willing to try to install a hot new product like high gloss wall panels. The good news is there is something you can do about this problem (even if you’re not the second reincarnation of Tim the Tool Man Taylor). Simply get the high gloss panels precut and predrilled with holes you need for your shower heads and valves (in the case of a shower) or with the outlets cut out (in the case of a kitchen backsplash). In this way, all you need to do to self-install them is apply the silicone and double-sided tape on the back and slap them up. High gloss acrylic wall panels are not the same as the 1/8” thick acrylic walls used by nationwide “One Day Bathroom” franchises who focus in on lower end showers. High gloss wall panels have a hard coat applied to the front which allows them to create a mirror like look and pop out from the wall. 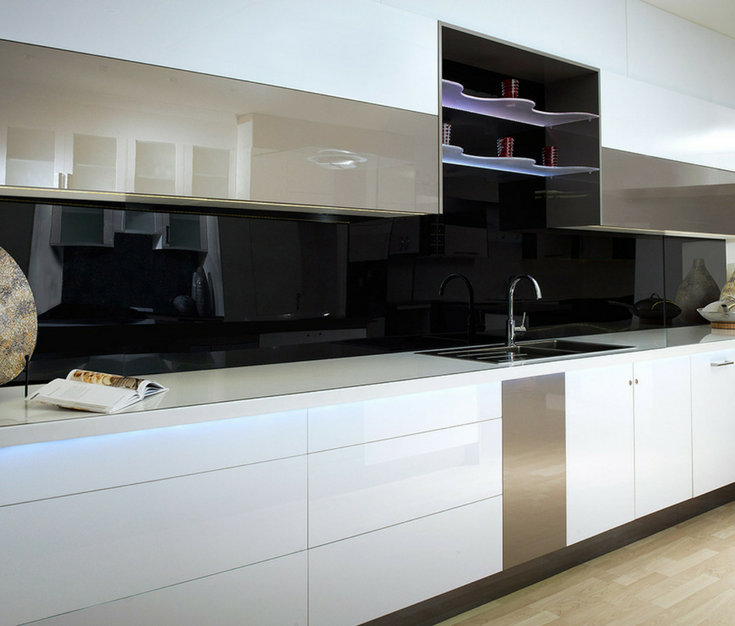 The high gloss surface has 20 times the impact strength of back painted glass – but is only ½ the weight. In addition, the hard surface has superior scratch resistance to standard acrylic wall panels. They are sleek, contemporary, colorful and create a Euro-inspired look. Yes – these panels are more expensive than the ‘bath-in-a-day’ variety – but they’re also infinitely more stylish. 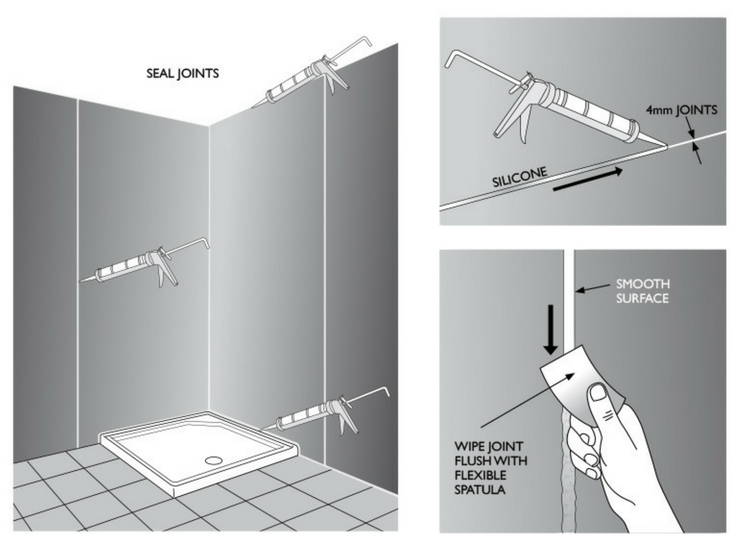 Where standard acrylic panels work well is they are low-priced alternative to a tile shower (which can be a good option in rental homes and investment properties). Back in the 1970’s and the 1980’s the “mullet” style hairdo was popularized by the likes of Rod Stewart and David Bowie. It came to be known as the hairdo with the “party in the back.” While that style has (fortunately) gone the way of the powder blue leisure suit I have to admit I wore (hey – I’ll blame my Mom for buying me that!) in the 1970’s, there are still some products where it is good if the “party” is in the back. 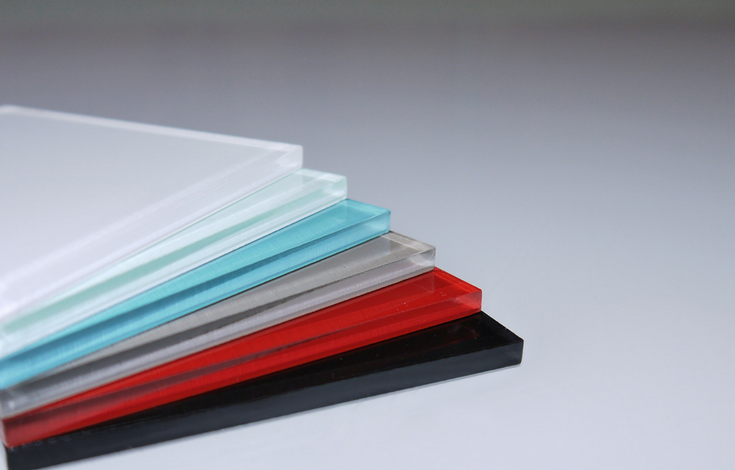 High gloss acrylic wall panels are one of those products. Putting the color (or the party) in the back of the panel makes sense because it is not subject to harmful UV rays and discoloration. The color in the back is the same approach as is used in more expensive back coated glass. High gloss wall panels have their place reflecting light off a wall and creating a mirrored light-filled contemporary look in a room They also help to block the view behind the wall surface (like tile you can’t see through these panels or get any water through the surface either) to the wall backer material they are applied onto. That’s the good news about high glass wall panels. The bad news may be that they aren’t a transparent or translucent glass material where light can transmit through the panels. If you’re looking to move light through a glass wall you’ll want to use real glass or a plexiglass. Even though not a lot is known about high gloss acrylic wall panels in this country what can be agreed on is they are a fun, striking material which makes a visual impact on any room you choose to use them (a bathroom, kitchen, classroom or a front desk office area in commercial buildings are most common). 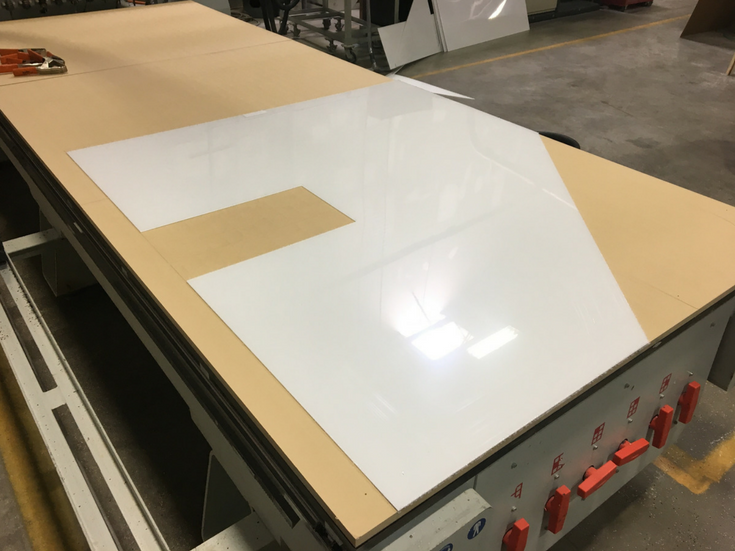 I believe as you dig a little deeper into this material you’ll also find they are easy to work with (especially if you have the panels pre-cut) and certainly not the same as the cheap acrylic you’ll see advertised by “One Day Bathroom” companies. 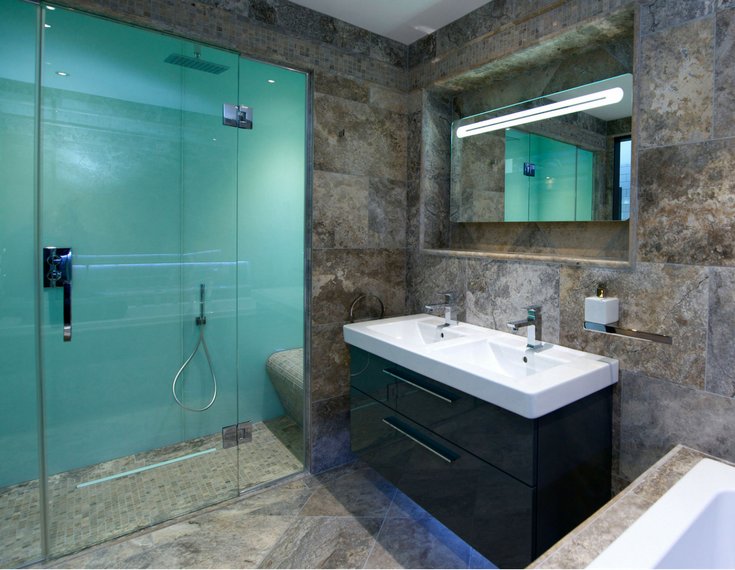 It is a stylish, contemporary and a luxury component to make your next bath, kitchen or office project distinctive. Hello, my name is David Porter, I have a kitchen and bathroom remodeling company, I am interested in your products,,panels …I would like to receive samples and literature,, that I may present to my customers to give them more options in there shower,bath and kitchen areas and look forward to doing future business with you!!!!! Thank you . 717-383-3997 David Porter thank you very much…. I want to apply high gloss wall panels to my new build bathroom shower, vanity backsplash as well as the kitchen backsplash. I can not find where to buy this in my area. Can you help? We are in The Abilene area of west texas, 3 hours west of ft worth. Thanks!